It seems that we are getting bombarded with commercial messages about the Holidays these days. It starts with all the “Black Friday” deals and continues on through Christmas with last minute shopping deals. It’s not an easy time to stay frugal, especially here in the US. 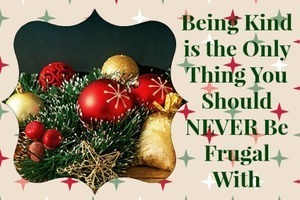 I’ll do my best to help you stay on budget with tips and ideas for a frugal Christmas over the coming weeks. Today though, I want to talk about something we should never be frugal about – Kindness to Others. It’s really what Christmas is all about and it doesn’t have to cost a dime. 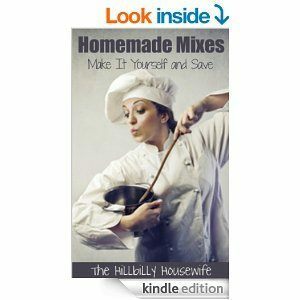 We all love to cook and bake around here… why not take advantage of this to show some kindness from the kitchen. If you’re making a big pot of soup for dinner this week, take some of it to a bachelor friend who probably hasn’t had a home-cooked meal since Thanksgiving. If you’re baking cookies, fix a plate of them and share them with the neighbors. If you hear about a food drive, look through your pantry and share some canned goods or mixes. None of this will cost you much but is a wonderful way to show some kindness to others. While spending money on loved ones isn’t always an option, you can generously spend your time. Often it’s a much more meaningful gift than anything you can buy. I’ve been spending a lot of time lately teaching my daughter to knit and we’re both having a blast. Think about who you could spend some time with over the coming weeks. Maybe it is inviting some friends over for coffee or tea and some chatting. Maybe it’s taking an elderly neighbor out to help with Christmas shopping. Or how about winterizing someone’s yard for them. Put on your thinking cap and find a few extra hours this week to show someone kindness. Look through your house. I’m sure you can find all sorts of things you no longer need from outgrown clothing to school supplies that the kids didn’t use and more. Find a few things that someone else in your life could use. Stick them in the box and take them over there. If you don’t know anyone personally, find a local shelter or charity that can get those items into the hands of a family that needs them.